Read my guest blog where historical novelist Tim Walker reveals a secret or two about the latest novel in his series, A Light in the Dark Ages. 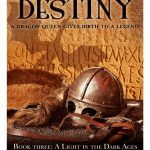 Uther’s Destiny is a bold skirmish into the darkness surrounding King Arthur’s origins. This entry was posted in A Writer's Life, Guest Bloggers by Elizabeth Gates. Bookmark the permalink. When I was four, I wrote my first story - mainly because no-one else had written the story I wanted to read. Later, with two degrees in English Language & Literature and Linguistics, I toured Europe as a creative writing tutor and then went on to work as a public health journalist for twenty-five years. Writing has always played a huge part in my life, coupled with history and travel. So my debut novel, The Wolf of Dalriada, seems a natural part of my progression through life. And when not writing, l like to spend time with my family and friends and the livestock that delights in trailing after me.